The Sydney Tri Giants have jumped to the top of the Sydney South East Interclub leader board after a superb outing this past weekend at the Nepean Triathlon. Coming off a disappointing first round, STG travelled to Penrith in great numbers and off the back of several excellent individual performances, the Giants secured enough points to be crowned victorious on the day in the Sydney South East Interclub, shooting up the leader board in the process. Cathy Verry brought home two valuable performance points by winning the Female 65-69 AG. She was well supported by her Club Coach, Sam Douglas, who finished 4th in the Pro Wave. Katherine Lukey, Daniel James and Alex Nixon all turned in great performances to finish 5th in their respective age groups. Tom Bills also put together a fine display with a 9th place in the 40-44 Male AG to round off a superb day for the Tri Giants. The Sydney Tri Giants will head to Kurnell and Round 3 of the Sydney South East Interclub with a spring in their step following this past weekend. “We started off slowly but now the wheels are in motion and we look forward to continuing our good form at Kurnell” Sam Douglas, STG Coach The Australian Chinese Dragons followed on from their encouraging debut at the Sydney Olympic Duathlon by turning in another strong performance at the Nepean Triathlon. Yanyan Jia and Joy Zheng the pick of the Dragons, both finishing in the top ten in their respective age groups. The Dragons are just half a point behind on the leader board after 2 rounds and look set to be play a starring role in the South East Interclub all-season long. Another encouraging day for the Coogee Comets at the Nepean Triathlon, headlined by Charles Leggett who was victorious in the 30-34 Male AG. Loren Lane finished runner-up in the 25-29 Female AG, as did Aaron Richardson in the 30-34 Male AG. Tom Irons securing further Performance Points with a 4th placed finish. The Comets slip to 3rd on the leader board after Nepean but remain one of the favourites to be crowned champion come the seasons end. Round 1 winners, the Eastern Suburb Swans, won’t be too disappointed with their outing, although they drop from first to fourth on the leader board. Alex Sweeney raced to a vital 7th placed finish in the 40-44 Male AG to ensure the Swans returned East with some Performance Points. The swans are just 2 points behind Coogee who sit third and are expecting a large turnout at Kurnell. They hope to be back on top come lunchtime on November 10th. The Bondi BRATS finished 5th on the day and remain 5th on the overall leader board but will be buoyed by their efforts at the Sydney International Regatta Centre. Paul O’Doherty will be delighted and deservedly so as he finished first in the 40-44 Male AG. Oliver Nicolle and Eduardo Skalski Bilek contributing Performance Points to the BRAT total, both with top Ten finishes to their name. The Bondi BRATS aren’t out of the equation just yet as they sit just 12.5 points off the top of the leader board. With 8 events still to go in the South East Interclub Series, it is still very much all to race for. Kurnell #1 will be key for BRATS as they can’t afford to fall any further behind if they have title aspirations. Tony Golden was the lone athlete for T4 but he came away from the Regatta Centre with a well-deserved 5th placed finish to secure some points for the T4 North Bondi Tritans on the day. 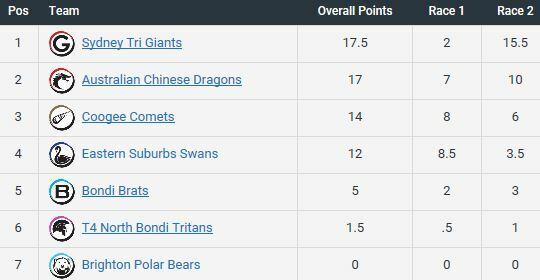 Kurnell #1 is all set to be a fascinating and potentially, a season defining race on the Sydney South East Interclub Calendar. One of potentially four teams could walk away in first place, with BRATS hoping to make it a five-horse race come December 8th and the Hills Garmin Series Race, which is the last event before the run into Christmas. The Brighton Polar Bears will be hoping to make their first appearance of the year at Kurnell.